1 of 3 Bring a large pot of lightly salted water to a boil. Add green beans; cover and cook for 4 minutes or until crisp-tender. Drain and set aside. 2 of 3 Heat oil in a large, deep nonstick skillet over medium-high heat. Add garlic and cook 30 seconds. Add curry paste and cook an additional 30 seconds. Whisk in coconut milk, chicken broth, fish sauce, sugar, cornstarch and salt. Bring to a boil; reduce heat and simmer 4 minutes. Add chicken and onion; cook, stirring, for 7 minutes. 3 of 3 Stir in peppers and reserved green beans. Cook 2 minutes to heat through. Tear in the basil. 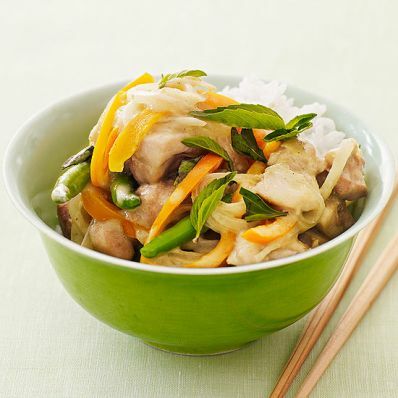 Serve with cooked jasmine rice. Per Serving: 693 mg sodium, 7 g fiber, 5 g sat. fat, 56 mg chol., 13 g Fat, total, 54 g carb., 34 g pro., 473 kcal cal.